I was dating a girl named Robin who lived in Morrill Tower. It was winter and it was cold and snowy. I think it might have been Valentine's Day. She kicked me out about 1 AM or so and I started making my way back to Stradley. It was freezing so I walked as fast as I could. Campus was deserted. No people. Not even any cars. Everybody with any sense was inside and warm. To save a few steps, I decided to cut through Mirror Lake Hollow. That's when I saw it. At first, it was just a blur of pink on the lake. The night was dark and the only colors were black and gray and the white of the snow. Seeing a flash of pink moving out on the frozen lake really surprised me. "What's that?" I wondered. I looked closer. It was like my eyes were unfocused--there was just this blur of color moving across the lake--but the more I looked. the clearer it got. I saw it was some kind of figure, a person. I figured it was some ice skating fan who had snuck down to the lake when campus was asleep. I kept looking and the figure got clearer. It was a woman and she was all done up in Victorian clothes. Then I noticed it. She was gliding all over the lake, twisting and turning and figure eights and all that but she wasn't leaving any tracks. There was snow on the ice and she wasn't disturbing it. The realization hit me hard. All at once, I knew what I was looking at. It was a ghost. My stomach seized up, my heart started pounding, and--in the middle of a freezing February night--I broke out in a sweat. I wasn't scared but I was having some kind of primal reaction. It's hard to explain but I knew it wasn't natural and I had to get out of there. I ran back to my dorm. The other thing I remember is that for about a week after that I was so sad all the time. I don't know why. I just felt really depressed and hopeless and sad. It went away but it was weird because that wasn't like me at all. 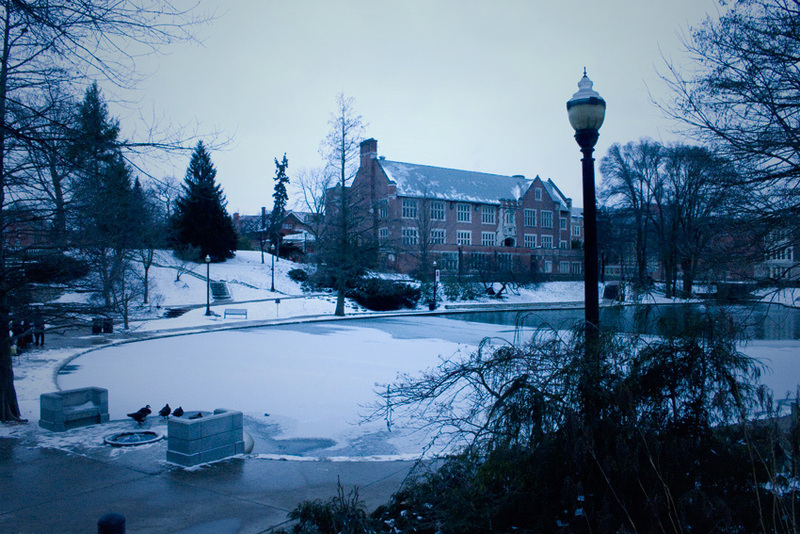 The University District's oldest ghost story is set appropriately in the very heart of campus, at Mirror Lake. It starts about a century ago with a couple, John and Margaret Clark. John was a young professor of geology at the university. Margaret was his beloved wife. They lived in a big house on what is now South Campus. John was devoted to his wife and they could often be seen walking hand-in-hand around campus. Margaret loved the winter and ice-skating and she and John spent many winter nights at the skate parties that were held at Mirror Lake. She always wore a fancy pink coat that John had bought her for Christmas. It was her favorite thing. She even had a fur muff dyed to match it. Margaret had grown up in humble circumstances. Her father had died when she was young and she and her mother had survived on the meager charity of relatives. As a child she had known hunger and hard times. John was determined that she should never want for anything again. He devoted himself to seeing that her every material want was satisfied. Of that desire was born their ruination. In 1896, gold was discovered in the Klondike. In 1899, gold was found near Nome. Suddenly everybody was looking to get rich quick--John Clark among them. Clark heard from a professional associate about a scheme to buy up Alaskan claims and then resell or lease them to would-be gold miners or to trade them on an exchange. On paper, it looked like a sure thing. The testimonials told of poor men who invested their meager savings and cashed out with thousands of dollars. John took the train up to Chicago and met with the scheme's organizer. The organizer told him there was a fortune to be made but time was short. There were only so many shares in the enterprise and word was getting around. John's hunger for quick riches got the best of him. He invested all of his savings in the scheme. Fearful of missing out on a once-in-a-lifetime opportunity, Clark borrowed and even took a second mortgage on his home to generate more money to invest. Clark borrowed far beyond his ability to repay but he was sure it couldn’t miss. All the while, his head was full of the wonderful things he would buy for Margaret: a new house, servants, jewelry, the latest fashions, a European tour, maybe even an automobile. Then disaster. The investment scheme turned out to be a fraud. The organizer disappeared with John's money and was never heard from again. The Clarks were wiped out. They lost everything. Their savings had evaporated, they were deep in debt, and they were in danger of losing their home. Clark panicked. He couldn't tell his wife what he had done. He couldn't face the look in her eyes when he revealed his stupidity and its cost. Not knowing where else to turn, Clark, in desperation, turned to the University and begged for help from the president. Perhaps some sort of loan or something could be arranged to enable him to get by, he pleaded. The president said he couldn’t help. Broken, Clark walked down to the snowy lake and shot himself. His body was found the next day in a snow-filled little garden that sat where Pomerene Hall is now. His last thoughts were no doubt of the many wonderful times he and his wife had shared there. On learning of her husband's suicide and the events that had precipitated it, Margaret lost her mind. She went completely mad and was incarcerated in a lunatic asylum where she died just a few years later. Beginning in the 1920s, students traveling through the dark, wooded Mirror Lake Hollow late on cold winter evenings began seeing the strange, silent, ethereal form of a woman in an antique pink costume, gliding over the frozen waters of the lake. Since then, on and off down through the decades, other students have seen the figure gliding across the ice. Could it be the spectre of poor mad Margaret reliving happier days?